On Monday, when I posted about the Blog Candy I'm giving away at the end of the week (click here for a chance to enter), I hinted at a big project that I was going to share with you today. 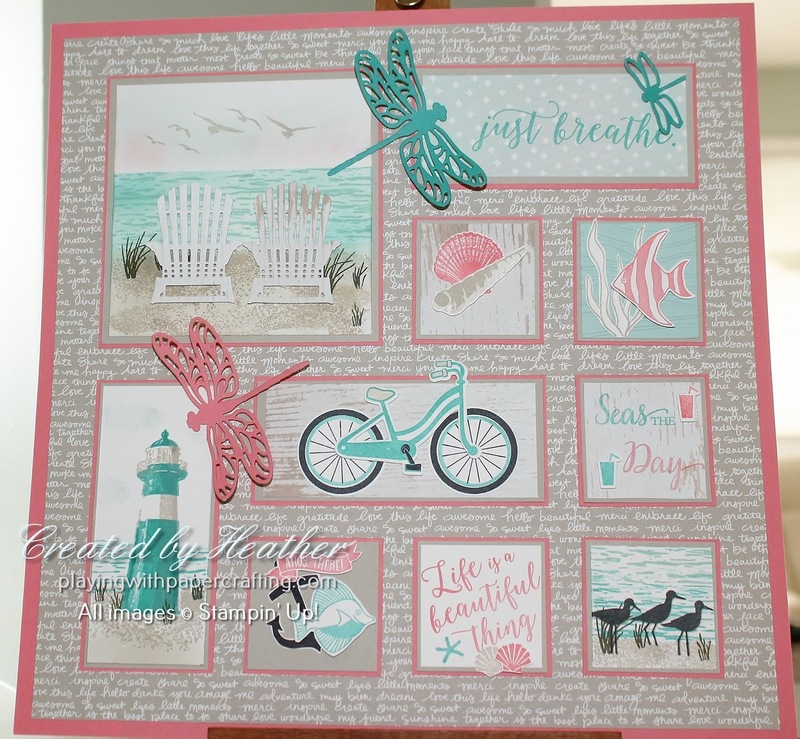 That project is finished and it is a Summer Seaside Sampler - a 12" x 12" piece of home decor that evokes summer and the beach and the sea! I designed it for my Tea & 3D class this month, but wanted to give you a peek at it as well. 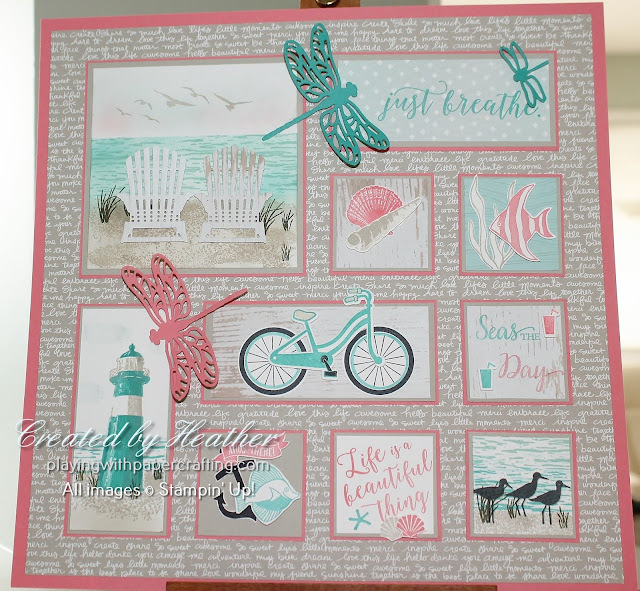 This makes use of 4 primary stamp sets along with coordinating dies where possible: High Tide, Colourful Seasons, So Many Shells, and Seaside Shore. 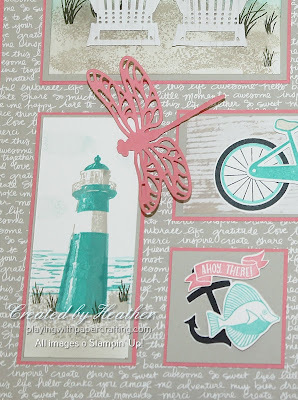 Along the way I threw in the Bike Ride bundle and the Detailed Dragonfly Thinlits. I took the opportunity of using up some of my retired Neutral Designer Series Paper Stack, which I still had a lot of, as a background designer paper over my base of Flirty Flamingo 12" x 12" cardstock. The basic square here is 2 1/8" x 2 1/8" while the long pieces are 2 1/8" x 4 5/8" and the large square is 4 5/8" square. I used some Naturally Eclectic Designer Series Paper as well as some Wood Textures Designer Series Paper Stack in the background of some of the squares. 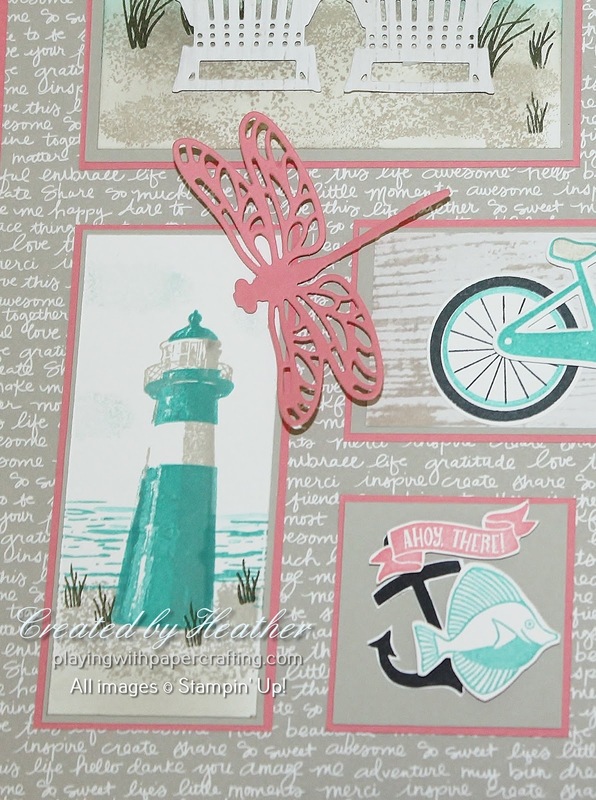 The wave and sand texture stamps from the High Tide stamp set were incredibly helpful for the scene panels that I created - the beach chairs, the lighthouse and the sandpipers. My basic colour palette is Flirty Flamingo, Sahara Sand, Bermuda Bay, and Crumb Cake along with Whisper White. It creates a very beachy appeal. The Daisy Delight Bundle is Back for Blog Candy!! New Product Shares are Up!